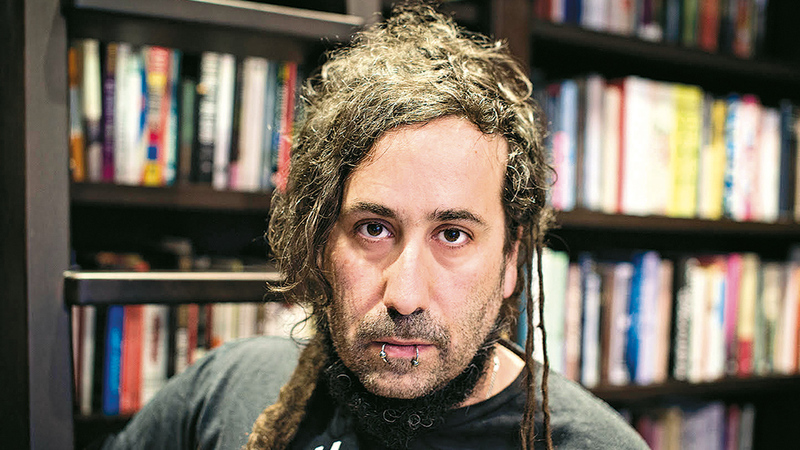 At first glance, Bram Presser looks more like a punk rocker than a sensitive novelist. He has two big lip piercings, a few scraggly dreadlocks, and a quirky beard only under his chin line. His grandfather, who later went by Jacob Rand, spoke about his experiences exactly twice. The first time it was on Yom Hashoah at the Melbourne Jewish school where he taught, and where the students were mesmerized by the manner in which he described even the smells of the camp. He spoke again, for 45 minutes, at the bar mitzvah of Bram’s older brother. The audience was less receptive, and he never discussed it again. A reprint in the Australian Jewish News of an older article about Rand, however, sparked Presser’s interest. It reported that Rand was part of the Talmudkommando, a select group of scholars assigned by the Nazis to evaluate the Jewish books and artifacts they stole. Supposedly the most valuable were to be included in the Museum of the Extinct Race, the Nazis’ planned “memorial” to the Jewish culture they hoped to erase. The more he learned, the more fascinated Presser became by his family’s history. There was his great-grandmother, Frantiska Roubickova, a convert to Judaism, and his grandmother, Dasa, a “mischlinge” (the Nazi term for someone of mixed race) who married Rand. A host of real historical figures — from a prewar Czech president, Tomas Masaryk, to Rabbi Judah Loew, the Maharal of Prague, one of the region’s leading rabbis in the 16th century — are also part of this multigeneration story. It quickly became clear to Presser that he needed to create a fictional landscape for it all to work. He spent years in research, making many trips to the Czech Republic, Israel, Poland, the United States, and England, and he devoured “hundreds of books,” he said. The last picture of Jacob Rand before “the hell into which he was cast … For most of the students, it would be their last photo ever.” He’s all the way on the left, in the double-breasted suit. If writing “The Book of Dirt” was bashert — “fated,” with Presser’s chance discovery of an article about his grandfather — so was his entry into the Jewish punk world. The group developed a significant following in Australia, appeared on TV, and filmed several videos. While they played festivals in America, “it was a lot more fringe, although we played one of the great venues, CBGB,” he said. But the group was warmly embraced by the punk scene. “They actively spoke up for us and protected us,” Presser said. Fortunately, Presser had a fall-back plan. For 10 years he attended classes to earn his law degree — he held a university record for the longest time it took to acquire a degree without failing a course. It was funny — At one point he got a teaching assistant position and later joined the school’s staff, in some cases attending classes alongside students he taught. These days, he’s living the life of a Jewish family man. Presser and his partner have a young daughter, and he continues to write. Now he’s concurrently working on two books, one of which he calls a “fable” of sorts. He’s also still busy promoting “The Book of Dirt,” which was published last fall, while on leave from his law firm.